The International Society for Krishna Consciousness (ISKCON), commonly known in the West as the Hare Krishna movement, is a monotheistic branch of the Gaudiya Vaishnava spiritual tradition that dates back to Krishna Himself—the Supreme Personality of Godhead who appeared on Earth and spoke the Bhagavad-gita over five thousand years ago. ISKCON follows Krishna's teachings as revealed in the sacred Vedas, including Bhagavad-gita and Srimad-Bhagavatam (aka Bhagavata Purana). Essential practices of Krishna Consciousness involve the chanting of God's holy names—among several processes of devotional service—to bring about lasting happiness and peace in society by reviving our loving relationships with God. 525 years ago Krishna appeared as Sri Chaitanya Mahaprabhu in the form of His own devotee to establish the congregational chanting of God's holy names, sankirtana, as the easiest and most sublime spiritual practice for this age. Sri Chaitanya Mahaprabhu popularized the chanting of the maha-mantra, comprised of sacred names of God: Hare Krishna, Hare Krishna, Krishna Krishna, Hare Hare/ Hare Rama, Hare Rama, Rama Rama, Hare Hare. In 1965, the prominent emissary of India's spiritual teachings, His Divine Grace A.C. Bhaktivedanta Swami Srila Prabhupada Prabhupada (1896-1977) brought Sri Chaitanya's movement to the West and founded ISKCON in New York City under seemingly humble circumstances. Here's a brief time line of ISKCON's recent history. In 1965, at the age of 69, A.C. Bhaktivedanta Swami Prabhupada left the holy land of Vrindavan, India, to spread Krishna's message in the West on the order of his spiritual master. He arrived in Boston by freight ship, carrying $7 in change and a trunk of books about Krishna. For the first year he struggled alone, booking speaking engagements at yoga studios, YMCAs, and bohemian artists' lofts, while living in the homes of people he met who sympathized with his cause and would give him temporary residence. He would often take a small bongo drum and sit under a tree in a public park to chant the holy names of Krishna. Curious onlookers would gather. Some joined in the chanting. Some began to take an active interest in his mission. By 1966 Srila Prabhupada was living in New York City, in Manhattan's then impoverished Lower East Side, and had begun regular weekly lectures on Bhagavad-gita, along with public chanting sessions, kirtan, in Tompkins Square Park. 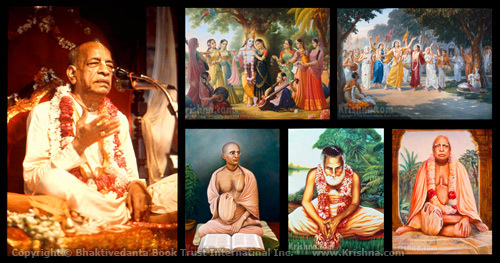 That same year, he incorporated ISKCON in New York City, envisioning that soon there would be centers around the world. From 1966 to 1968, as more and more spiritual seekers became attracted to Krishna consciousness, he opened ISKCON temples in New York, Los Angeles, San Francisco, Seattle, Montreal, and Santa Fe, New Mexico. In 1967, the first Ratha-yatra festival outside of India was held in San Francisco. Ratha-yatra is one of the oldest and largest annual religious festivals in the world, performed each year in the holy city of Jagannatha Puri on the East Coast of India. Several million people line the streets to pull giant 3-story chariots carrying deity forms of Lord Krishna through the streets, accompanied by festive chanting of His names. This festival is now held by members of ISKCON in cities around the world. From 1969 to 1973, temples opened in Europe, Canada, South America, Mexico, Africa, and India. In 1970, the Governing Body Commission, ISKCON’s managerial body, was established to oversee the growing society. From 1970 to 1977, ISKCON built major centers at the holy pilgrimage sites of Mayapur and Vrindavana, India, and a large temple in Mumbai. In 1972, Srila Prabhupada founded the publishing house Bhaktivedanta Book Trust (BBT), now the world’s foremost publisher of books on Krishna consciousness, or bhakti-yoga. Krishna.com is a website project of the BBT. From 1966 through 1977, Srila Prabhupada translated more than 40 volumes of the great classics of Krishna conscious literature from Sanskrit into English, giving elaborate commentaries synthesizing the realizations of previous masters along with his own. These books include Bhagavad-gita As It Is, the definitive presentation of Lord Krishna's teachings, Srimad-Bhagavatam (Bhagavata Purana), the 18-volume history of Lord Krishna's incarnations, pastimes and devotees, and Sri Caitanya-caritamrita, the 9-volume biography and teachings of Sri Chaitanya Mahaprabhu. These books have been published by the BBT in more than 50 languages, with several million copies sold and distributed by members of ISKCON to people all over the world. In 1973, the Bhaktivedanta Institute was formed to promote the teachings of the Vedas in scientific terms. Since 1974, ISKCON Food for Life has run karma-free vegetarian food relief programs in disaster areas and cities around the world. In November 1977, Srila Prabhupada passed from this world. By that time, ISKCON had established more than 108 temples, centers, schools farm communities, with more than 10,000 initiated members. In 1989, the Hare Krishna movement came out from the underground in the Soviet Union, as glasnost brought an end to persecution. By 1991, more than one million copies of Srila Prabhupada’s Bhagavad-gita As It Is had been sold in the former Soviet Union. In the early 1990s, various Internet projects were launched, including Krishna.com, ISKCON.com and other Hare Krishna websites. Today, ISKCON has about 500 centers around the world, with a worldwide congregation in the hundreds of thousands—from all walks of life. Just as the sun is known by many names in different parts of the world, “ISKCON,” “Krishna consciousness,” and “Krishna” Himself are non-sectarian and non-denominational terms which refer to the worship of God, the Supreme Person. Anyone, anywhere can practice Krishna consciousness and become a “fan” or member of ISKCON. You do not need to change your religion to adopt the practices of Krishna consciousness—such as chanting God's names. Although “Krishna consciousness” is culturally recognizable as coming from the Gaudiya Vaishnava tradition within (what’s commonly known as) Hinduism, it refers to the eternal function of the soul, sanatana dharma. As such, it transcends the limitations of temporary material bodies and their associated designations. FAQ: Is Krishna consciousness part of Hinduism?